We have a lot of nimona recipes on Banaras ka Khana and if you have been following this blog for some time you would have come across this spicy matar ka nimona, the tender peas nimona, mungodi wala matar ka nimona, alu gobhi wala matar ka nimona, harey chane ka nimona and even masoor dal ka nimona. To cut the long story short, nimona is a curry where the gravy is made with a liquidized ingredient and there are some vegetables of mungodi or vadi added to the gravy. All these variants of nimona used to be a winter specialty owing to the ready availability of a lot of vegetables and greens. Liquidizing the vegetables makes sense if one wants to consume them in larger amounts. Clever ways to use up fresh produce. 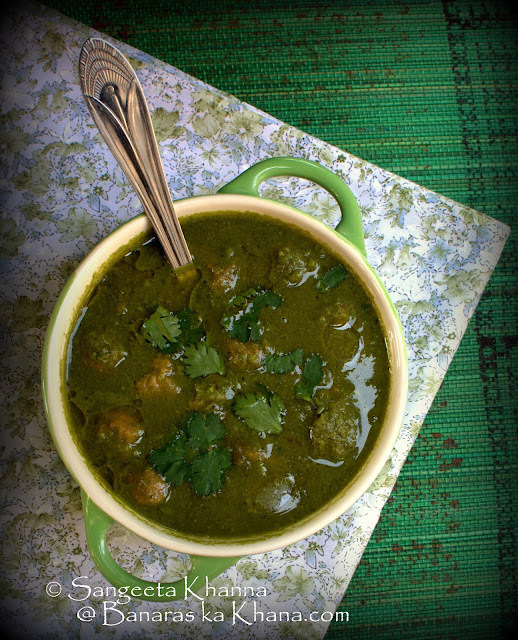 Here is the next nimona recipe and this is palak ka nimona. This palak ka nimona is a curried spinach gravy with mungodis or fried mung fritters or masoor daal vadis. Sometimes a little besan (chickpea flour) or lentil paste was added to the palak ka nimona to give it body. This masoor daal bhapouri (steamed lentil cakes) was also a common addition to palak ka nimona and I remember some street food stalls had adapted this curry into a chaat specialty. Larger masoor daal steamed dumplings soaked in spinach gravy, served almost like a dahi vada sprinkled with fine sev, some dry cooked kala chana and bit of onion and green chillies. Back in my maternal grandmother's place, this chaat was also called as Bhapouri or baphouri. Make a paste of the lentil fritter ingredients without adding any water. In the same blender puree the spinach too. The remains of the lentils paste will thicken the gravy and make it more robust in taste. Deep fry the fritters if doing so. Else follow the bhapouri recipe to steam them. Heat 2 tsp mustard oil for the gravy. Add hing, ginger garlic paste and fry till oil released. Add the curry powder and turmeric, fry a little and then add the spinach puree and tomato paste or yogurt. Mix well, simmer for 3-4 minutes. Add the steamed fritters (lightly shallow fried if you wish) or deep fried ones. Add a little water to adjust consistency and simmer the curry till the fritters have soaked the essence of gravy. Serve hot garnished with some ghee and coriander greens. Note that this palak ka nimona can be made without the fritters too. Some people like it with shallow fried florets of cauliflowers and green peas, may be some boiled potatoes too. This palak ka nimona pairs well with plain boiled rice as well as multi grain roti, millet rotis or phulkas.